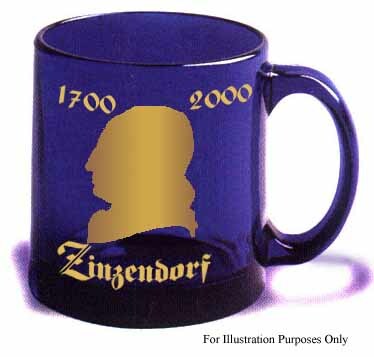 Commemorative coffee mug issued by Comenius Foundation in honor of the Zinzendorf Tercentennial in 2000. Heavy cobalt glass by Libbey with 24 carat gold design. Dishwasher safe, but don't microwave due to the gold imprint! Hurry, only a few remaining! Medallion-style coin struck in Germany in commemoration of the Zinzendorf Tercentenary. 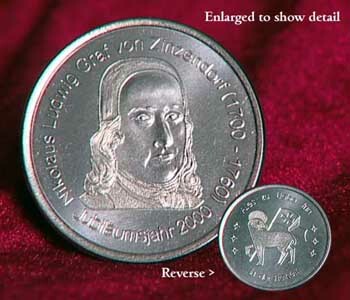 Obverse has face of the Count, with the text "Nikolaus Ludwig Graf von Zinzendorf (1700-1760) Jubiläumsjahr 2000." Reverse has the Moravian Lamb (Agnus Dei) with the text "Alles zu Liebe tun - in der Freiheit." In plastic collector case, with certificate of authenticity. Very rare, we have only a few left, so collectors should hurry!